The censorship battle over the D.W. Griffith film, “The Birth of a Nation,” was now being fought in court. The Auditorium Theatre manager filed an injunction to prevent the city from enforcing its censorship decree, in which it ordered the theater to delete several controversial scenes. The city then responded by invoking a seldom-enforced Sunday closing law, threatening to close the theater on the first day of the run. The city’s attorney said this was an attempt to show that the city had authority to regulate theaters. 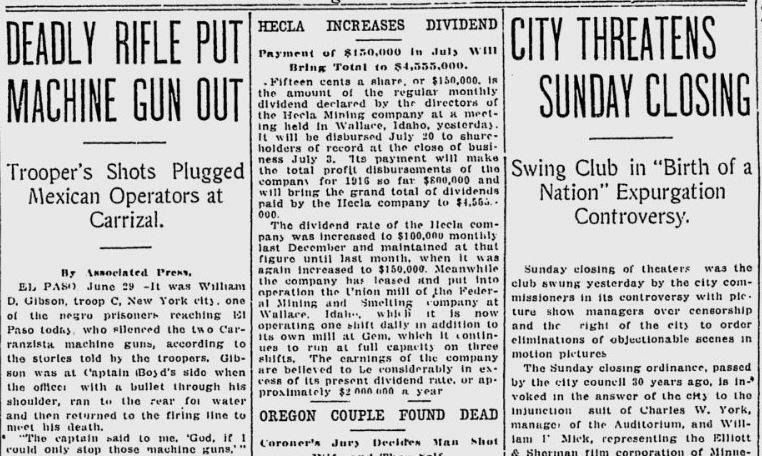 He said the city would “invoke all means in its power to enforce a compliance.” The paper’s headline referred to this as the city’s attempt to swing a “club.” The Auditorium took out an ad saying the movie would “positively” run all week. From the crime beat: A large number of Spokane auto owners reported that their license plates had been stolen – and police said they thought they knew why. They said they believed that a “thoroughly organized gang of automobile thieves” was in Spokane, stealing license plates in preparation for putting them on stolen machines.